UPDATE, 10/21/17: See below for information on parking, along with a detail of the campus map. UPDATE, 10/6/17: The complete schedule is now available by clicking here. Participants in this year’s conference will have the option to register for the Conference Only for $100 or the Conference plus Pre-Conference Writing Workshop at the ESSE Purse Museum & Store in Little Rock for $135 (limit 15 participants). Late registration fees begin October 27, 2017, with the prices becoming $135 and $175, respectively. More detailed information can be found below. The 2017 C. D. Wright Women Writers Conference, taking place November 3-4, 2017, will include an optional, limited-seating pre-conference writing workshop, a Friday night keynote presentation with reception, a book fair, a continental breakfast, choices from 16 individual breakout sessions of either panels or creative readings, a keynote lunch, and a closing reception featuring a reading by the winners of our Nan Snow Emerging Writer Award. Aside from our pre-conference workshop, all conference events will take place at the University of Central Arkansas in Conway, and the closest airport is the Bill and Hillary Clinton National Airport in Little Rock, which is 37 miles away. Volunteer carpools will be arranged to transport attendees to and from the airport on Friday and Sunday at no charge. Information on lodging is provided on the registration website; however, there are no hotels within walking distance of the campus. There will be an opportunity to arrange roommates and ridesharing for the duration of the conference. Access to these arrangements will be offered via email once a participant has paid for registration. *With sponsorship from the University of Central Arkansas, the University of Central Arkansas Foundation, the College of Fine Arts and Communication, and the Department of Film, Theatre, and Creative Writing registration fees are waived for UCA students enrolled in courses for Fall 2017. Interested students should not use the registration link below. They should email the director at cdwrightconference@gmail.com. When ready to register, please click here and follow the directions on the registration site. All questions should be sent to the Director, Sandy Longhorn, at cdwrightconference@gmail.com. *UCA students should not use this link to register. Instead, they should email the director. For those people interested in attending our Saturday keynote event only, featuring Cara Brookins, author of Rise: How a House Built a Family, as well as a buffet lunch, the cost is $25. To proceed, please make a $25 donation to the conference here and note in the comments section that your donation is for the Saturday keynote. Then, email the director at cdwrightconference@gmail.com. If you'd rather pay by check, please email the director for more information. Once the donation has been made, the director will confirm your reservation and provide details on where you will pick up your badge (in lieu of a ticket) on Saturday, November 4. The event takes place from 12:15 p.m. - 1:45 p.m. in McCastlain Hall on the UCA campus. *UPDATE, 10/15/17: The Hilton Garden Inn is nearly sold out. If you will be relying on carpooling to and from your hotel to the conference and cannot get a room at the Hilton Garden Inn, please choose an alternate hotel at the intersection of I-40 and Oak St. (Hwy 64). The conference hotel is the Hilton Garden Inn (Conway, AR), and our conference rate is $91 per night, plus tax. When you receive your registration confirmation email, there will be a chance to link to the hotel and make a reservation. Conference organizers have created a Google Doc where anyone interested in sharing a room, or sharing rides, may post information. The conference will include a small book fair. Book fair fees do not include registration to attend events or receptions/meals. The conference also has sponsor packages for presses, authors, or businesses interested in supporting the conference at a higher level, with additional benefits. To inquire about fees and reservations for the book fair, or to receive information on our sponsor packages, please email the Director at cdwrightconference@gmail.com. All registered conference attendees should have received a confirmation email from RegOnline, our registration system provider. That email included a parking pass. Please print this in advance (black & white is fine) and place it on your dash. If you have misplaced the email, please email the director as soon as possible. The majority of our events take place in McCastlain Hall, including registration and check-in. Parking is available behind Wingo Hall and behind/between Schichtl Studio Arts and the College of Business. You are free to park in any purple, yellow, or white spaces. Elsewhere on campus, please do not park in any green spaces (residential student spaces). 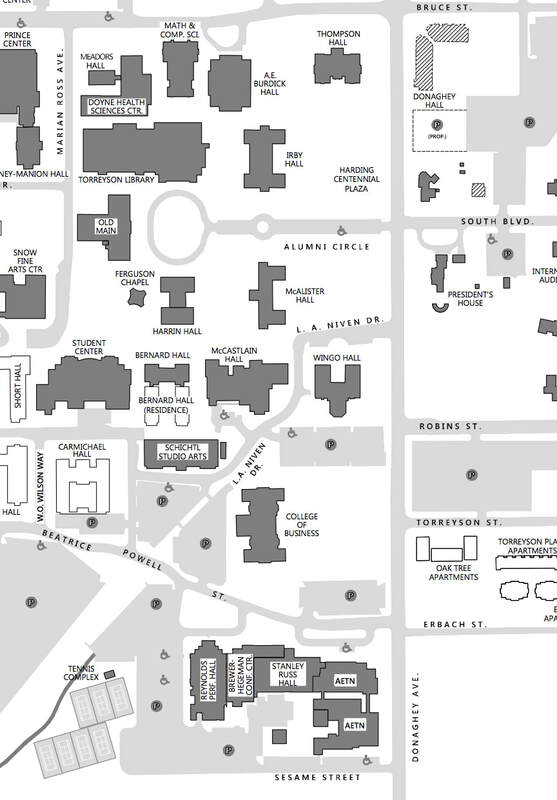 The complete campus map may be accessed here, with the excerpt below showing the main conference areas in more detail. The conference will be held on the UCA campus in the College of Business auditorium and McCastlain Hall on Friday, November 3, 2017 and Saturday, November 4, 2017. The pre-conference workshop (with limited seating) will be held at the ESSE Purse Museum & Store, 1510 Main St. Little Rock, AR, from 1:00-3:00pm on Friday, November 3, 2017.